The title tag or to be more accurate the title element (it’s an HTML element, not a meta tag, but most webmasters think it’s a meta tag like the meta description tag) is what you see at the top of web browsers like Google Chrome and Firefox. 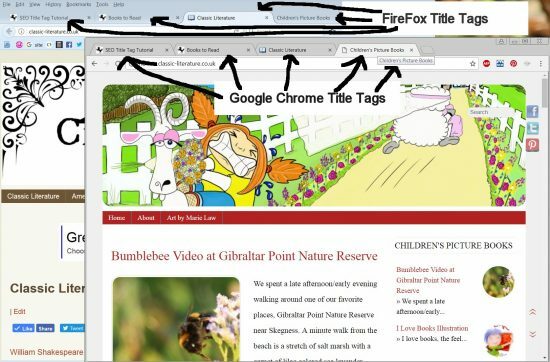 If you are using Google Chrome or Firefox to view this SEO tutorial look at it’s browser tab and you will see this webpages title tag, it’s: “Title Tag SEO”. Google and other search engines use a webpages title tag as a major ranking signal making title tag SEO a very important part of any webmasters SEO strategy. I set this webpages title tag to “Title Tag SEO” because I want Google etc… to rank this webpage for SERPs related to “Title Tag SEO”: SEO isn’t difficult to understand. 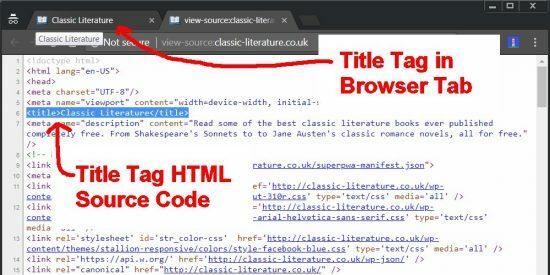 Title tag HTML code is quite basic, you have an opening <title> element and a closing </title> element and whatever is put between them for a specific webpage is that webpages title tag. That’s all the title tag is. 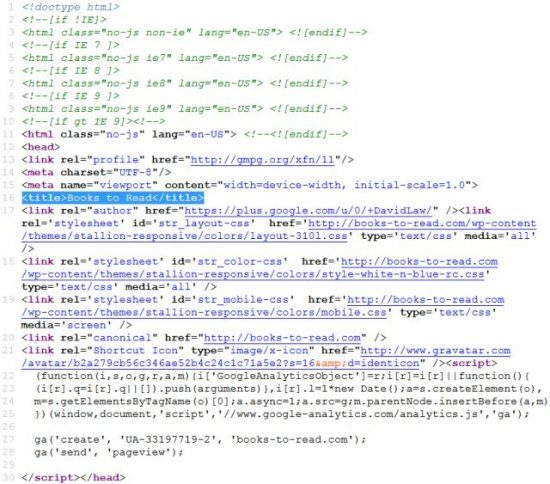 Below is a screenshot of this websites home page title tag in Google Chrome including the HTML source code. You can see in the screenshot the home pages title tag is simply SEO Gold. It’s a little difficult to ‘read’ the HTML code for this site because for SEO reasons I minify the HTML code (via a WordPress SEO plugin): minifying the HTML source code means removing the extra spaces (white space), tabs, HTML comments and carriage returns so the HTML code is all on one line taking up as little space as possible (means the HTML file is smaller and loads a little faster, but the code is harder to read). I’m working on my very old Classic Literature site (working on an SEO update) and have the minification turned off, below is a screenshot of the title tags HTML source code, much easier to read. To build a webpage from scratch you might start with HTML code like this, it’s about as basic as it gets. Most websites in 2018 will be built using Content Management Systems (CMS) like WordPress, not by manually creating HTML webpages. This webpages title tag is Title Tag SEO and by default WordPress created it via the WordPress Posts title and any WordPress theme/plugin title tag features, see screenshot below. 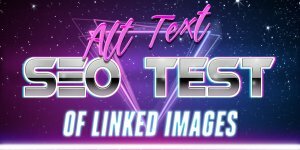 For this website I have any theme/plugin title tag relevant features to ONLY use the title of a WordPress Post as the title tag. 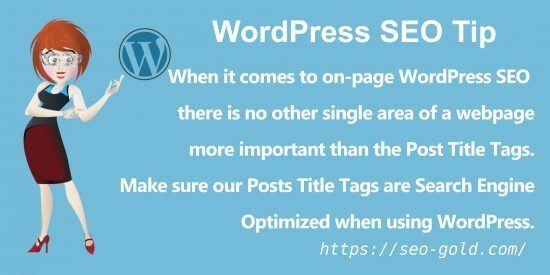 There are WordPress SEO Theme and SEO Plugins features which add all sorts of stuff to a WordPress Posts Title tag, from the Site Name to the name of Categories and Tags!!! If you believe your webpages are creating the wrong title tags the easiest way to know for sure what is output as a title tag is load different sections of the site (Home Page, Categories, Tags, Posts etc…) in a browser like Google Chrome and hover over the browser tab (the title tag pops up, see earlier screenshots) and/or view the HTML source code and literally search through the HTML code (should be close to the top) to see what’s between the opening and closing title HTML elements. If the title tag output isn’t what you expect it to be, check how your title tags are generated and modify accordingly. 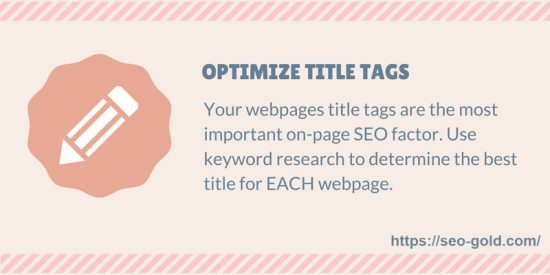 Now you know what a title tag is and how it’s generated let’s discus how to search engine optimize title tags. 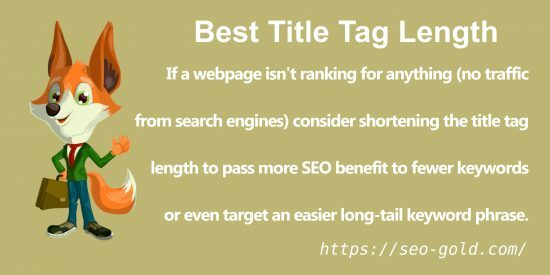 There’s no one right way to optimize a particular webpages title tag, sometimes a short title tag (like this articles title tag) is best, other times a much longer title makes sense. 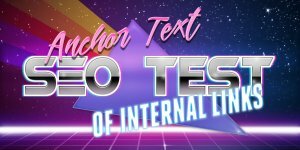 There’s isn’t one correct title tag length, each webpage has unique SEO, brand and user requirements. First thing to decide is branded or unbranded title tags? Unless you are a regular visitor to my website I can bet the farm you’ve never heard of the brand “SEO Gold”. 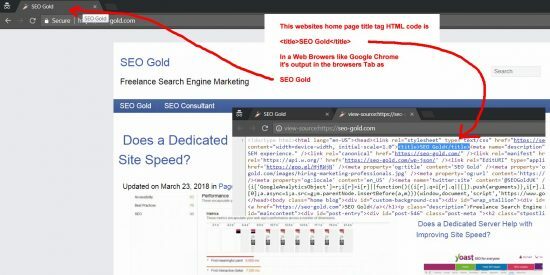 SEO Gold isn’t a well know brand name, very few people are searching in Google for SEO Gold, so there’s little to gain optimizing a webpage like this one to include the brand name SEO Gold. I registered the seo-gold.com domain way back in 2004 and traded under the name SEO Gold Services or SEO Gold for short. There’s a city in Australia called Gold Coast (6th largest Australian city) and there’s quite a number of businesses with names related to SEO Gold Coast. Most of the SEO Gold Coast businesses look like web design businesses who also offer SEO services. When I registered the SEO Gold domain (2004) I don’t recall noticing any SEO companies with websites from the Gold Coast. No one is searching Google for “SEO Gold Title Tag SEO” or “Title Tags SEO Gold” and the Google users searching for SEO Gold Coast SERPs are highly unlikely to be looking for my SEO service: they are presumably looking for a local SEO company near the Gold Coast city, the traffic won’t convert – I’m in the UK, couldn’t be much further away if I tried. This sites home page is already ranked in the top 1 or 2 in Google for the SEO Gold SERP and it generates a trickle of traffic, I only need the home page to target the brand name. Google also automatically appends the brand name (with the format “ – SEO Gold“) to this domains SERPs when there is space (when title tags are short). 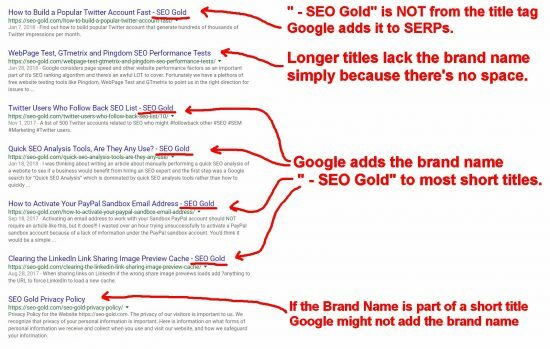 Conversely if SEO Gold was a huge brand name like Amazon, Flipkart, Tescos, Google, Coca Coal, Puma, Nike etc… brand names the majority of people already know OR I was building a brand presence for SEO Gold it makes sense to include the brand name at the end of title tags. Before making an SEO decision (a business decision) always consider what you are trying to achieve. Remember title tags are NOT only used by search engines, they are used as part of browser Bookmarks, if someone Bookmarks this webpage it’s saved with the title “Title Tag SEO” with no branding. If a webpage gets Bookmarked a lot and you want your brand name as part of it, you have to add it via the title tag.